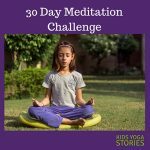 30 Day Meditation Challenge. New Year. New Goal. Join our 30 Day Meditation Challenge by downloading the printable poster below. Back in September, 2014, my husband and I finally stopped procrastinating and began our practice of sitting silently for fifteen minutes every morning. After years of talking about meditating, … [Read more...] about 30 Day Meditation Challenge. New Year. New Goal.